The scaphoid is a small bone in the wrist, located on the radial side of the wrist (the side where the thumb is located). A scaphoid fracture typically occurs in contact and collision sports where an athlete falls on his outstretched hand. Unfortunately it is an injury that is commonly missed, as the athlete is often given a diagnosis of wrist sprain. Evaluation by a sports medicine physician or hand surgeon is recommended very soon after the injury to avoid misdiagnosis. 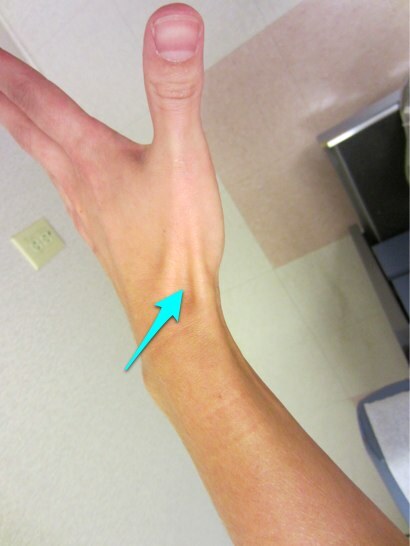 Typically the athlete will have significant tenderness to palpation in what is referred to as the “anatomic snuffbox.” This is a specific area of the wrist just past the end of the radius (one of the forearm bones) just before the base of the thumb. X-rays of a wrist injury should always be obtained to look for a scaphoid fracture. Bone scans or MRIs are sometimes ordered if x-rays are unclear or the examination suggests a scaphoid fracture but the x-rays do not show one. Recommended treatment is somewhat controversial. If the fracture is nondisplaced, some surgeons recommend treatment in a cast to try to get the fracture to heal. Fractures that are displaced, meaning that the fracture ends are not lined up perfectly, should be fixed surgically. Surgery typically involves making an incision to get to the fracture and putting a screw across the fracture fragments to hold the fracture in the proper position. In high-level athletes, surgery is often recommended even for non-displaced fractures. Screw fixation often allows the athlete to get back to sports sooner, especially if he can play in a padded cast. Often soccer players and football players who play certain positions can play in a padded cast soon after surgery. Treatment options for scaphoid fractures. The reason that this fracture needs to be diagnosed quickly is that scaphoid fractures can often become a nonunion. The blood supply to parts of the scaphoid is tenuous. Nonunion or healing of the scaphoid in a bad position can lead to a problem known as avascular necrosis, in which part or all of the scaphoid dies due to lack of blood supply. This can lead to degenerative changes in the wrist, which can be a debilitating problem long term. Proper evaluation and treatment of this fracture is critical for long-term use of the wrist. The scaphoid can be palpated between the tendons that extend the thumb and wrist (light blue arrow). Will Marshall play with surgically repaired wrist?